It was a pretty busy week so this one will be rather quick. For some reason, I was intrigued by logarithms growing up. I really don’t know why, but the fascination grew as I went to business school and saw how so many important financial equations use natural logs. They’re particularly good to use when you have a long series of data in which the natural progression is higher. Think of investing $100 in the bank 50 years ago and graphing how it grows over time due to compound interest. As a result, comparing the dollar change today to what it was many years ago could be misleading since a 5% growth of $1 million is far more than it was when it was $100,000. The percentage change is the same but the dollar differential is quite different. 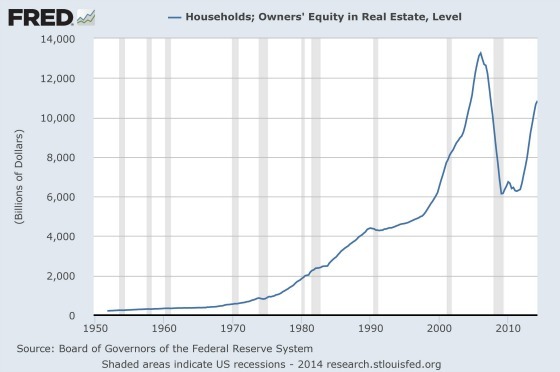 From this graph, it looks like we had a brutal downturn in the housing market, which of course we did. Yet the way it is scaled overstates the volatility somewhat since it is showing absolute dollars and how this changes each year versus percentage changes. Transforming the data into a logarithmic chart makes things appear very different. Clearly, the drop was unprecedented but when transformed into a log scale it is not as dramatic. The natural tendency is for home equity to grow over time as the population grows and personal income rises. 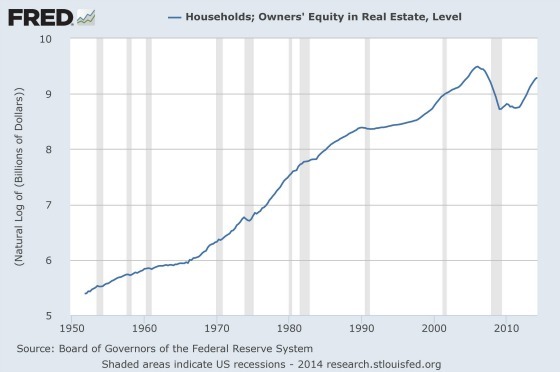 Nevertheless, mortgage investors believed that home equity would never drop when making risky loans in the mid-2000s because of the trajectory of this chart. Let’s transform it one more time to show the annual percentage change by year. Home equity tends to grow at some very healthy clips over long periods of time reflecting the natural bias for prices to go higher and due to additions to the housing stock through new construction and improvements. In addition, the fact that many people use borrowed money to purchase their homes also magnifies the returns. For example, someone with a 50% loan-to-value will see his or her equity grow by 10% if home prices go up by 5%. If the loan is 25% then the growth in equity shoots up to 20%. That is why the housing depression was so decimating. Equity dropped by nearly 23% per year for three years, or by 54% cumulatively. This was clearly the biggest asset of so many individuals and families in the economy. To answer this, I turn back to the log chart I see a housing market that appears to be returning to trend. It’s growing slowly but steadily, the loans being issued are generally well underwritten, and there does not appear to be much excess in terms of speculation or aggressive lending. This may change somewhat as the regulator overseeing Fannie Mae and Freddie Mac announced that they will buy loans with lower credit standards but I don’t think enough to result in more rapid appreciation for long periods of time. 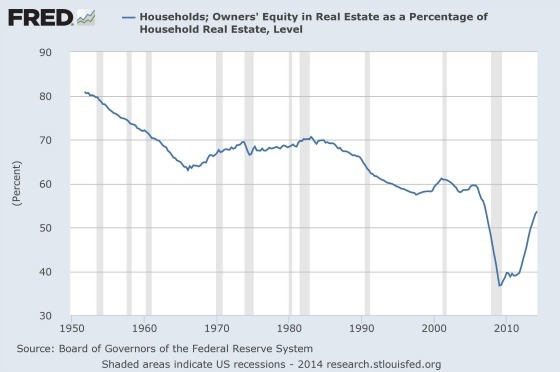 Housing has now become a much smaller percentage of the economy than in the heyday of the mid-2000s. 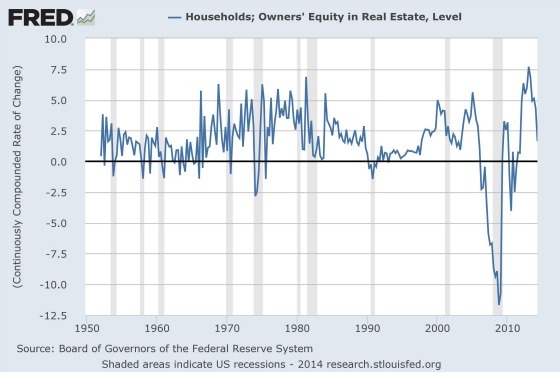 As the graph below shows, homeowner equity as a percentage of value has been dropping for many decades, although it has now started to move up after the carnage of The Great Recession. Between 1975 and 1999 home prices appreciated on average 5.5% per year and through 2014 it has grown at a 4.5% clip. Without factoring in growing the housing stock resulting from net additions (new construction fewer demolitions), a 5% growth in home values should result in approximately $1 trillion per year in equity build up. This should provide the economy with a healthy tailwind. Of course, home prices can go down, but that seems like less of a concern than perhaps other parts of the economy not carrying their load. From an apartment owner’s perspective, it seems to be a healthy balance such that housing can be a source of economic growth but not significant enough to meaningfully cut into renter household formations. Overall, I see housing as being a much safer investment for those who have a long-term horizon, they don’t intend to move within five years, and have sufficient financial reserves to weather a financial setback. 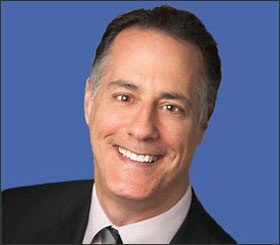 And from a landlord perspective, I still this being the golden age of renting as there is still a very large demand for apartments among those entering the workforce and those who will and eventually move out of their parents’ homes. Balanced investing – is there a financial benefit of home ownership in today’s market? Please share your thoughts in the comments below. ‹ Markets Climb Walls of Worry – Is it Time to Worry? Of course this “equity” doesn’t factor in the continual repairs and maintenance needed to maintain homes. I also think obsolescence plays more of a part than ever. Outside of a handful of booming markets, many homes built in the 70s or even the 80s are VERY tough to sell as most buyers factor in the significant costs of updating which can be massive. If the equity figures subtracted the above costs I wouldn’t be shocked if equity does anything more than match the CPI. New research from the real estate website Trulia finds that homeownership is less expensive than renting in all of the country’s 100 largest metropolitan areas. 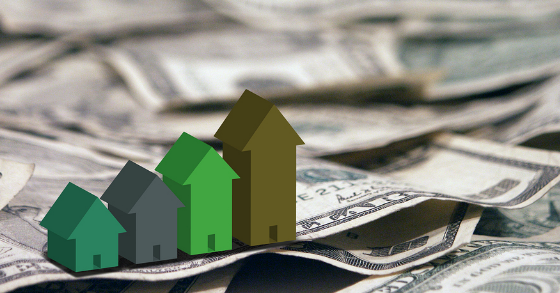 The advantage narrows considerably, however, when the home buyer uses a low-down-payment loan insured by the Federal Housing Administration. Trulia’s calculations assume that the home buyer puts 20 percent down and has a 30-year fixed mortgage at 4.3 percent. Consistent with Gary’s thesis that there can be peaceful coexistence since many are now reluctant or not able to go 80% LTV and 30 yrs. However, if the mortgage interest rate keeps sliding (thank you Euro investors in Treasury bonds!) and the changing credit standards at Fannie & Freddie allow lower down payments the playing field may tilt. Albeit slowly. The cure for high rents is: High rents. Apartment construction permits on the way up in Houston. HOUSTON – For the seventh consecutive month, the 12-month total for construction permitting in the City of Houston set another record in Sept. — topping $8.6 billion, a 51.3 percent increase from $5.7 billion in permits issued over the 12-months ending Sept. 2013, according to the Greater Houston Partnership. Permitting activity in Sept. 2014 totaled $1.2 billion, the highest monthly total on record and a 161.9 percent increase from the $469.7 million in permits issued in Sept. 2013. Residential permits increased 119.4 percent from $198.1 million in Sept. 2013 to $434.4 million in Sept. 2014. Multifamily permits nearly quadrupled year-over-year, from $77.4 million (13 buildings) in Sept. 2013 to $294.5 million (94 buildings) in Sept. 2014. The City approved permits for hotel construction valued at $225.4 million in Sept. 2014, up from $950,000 in Sept. 2013. Office building permits increased from $47.8 million in Sept. 2013 to $236.9 million in Sept. 2014. Click here to see the full Building Permits Update from the Greater Houston Partnership for Sept. 2014.